Have you suspected that your home is affected by the molds? Are you noticing excess moisture in your home? Is there a sewage backup or plumbing leak? If your answer to these questions is yes, then, you must take the right steps to get rid of these serious problems without any delay. Molds not only affect your home, but, these can be fatal for your health too. Some type of molds can affect your health by causing high fever, dermatitis or asthma attacks. Hiring professional mold services can help you to get rid of this problem. Mold removal services involve identification of issues arising from mold and solving them whether it is from a commercial building or home. The mold removal professionals have a vast experience and possess an extensive knowledge to undertake a project and execute it properly. These professionals use various cleaning agents and advanced equipments which are not easily available at your home. In addition, when you try to get rid of molds on your own, there are more chances that you could expose yourself to serious health hazards. Removal of molds can be easy and it may be very simple in some cases. However, it is also essential to take the steps to prevent the spreading of the molds, so that, it does not affect your home anymore. Since mold grows due to moisture, the mold removal professionals initially, identify the source of moisture. They ensure that you don’t have to face mold problems anymore in the future by removal of molds. This further reduces the spreading of molds in your home. Molds can grow again if you are not able to identify the source of their growth. 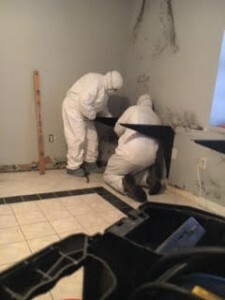 Mold removal professionals have the right tools and skills to investigate where the other molds are hidden at your home. Once the source is detected, they are also able to determine from where and how the outbreak of these molds started. Hence, by hiring professional mold services, it is possible to not only remove the existing molds from your home, but, it also eradicates their source of breeding. Some kinds of molds are harmful to humans as well as pets and can further cause serious health problems like allergies, asthma, respiratory distress and many more. A Professional mold removal service provider will help you reduce health concerns of your family. By cleaning molds by yourself, you can expose yourself to serious health issues. You can also protect your belongings and home as these harmful molds can destroy your personal items and structures. Hiring a professional mold removal service is essential because mold can cause serious health problems, especially, for those who have compromised with their immune system and are allergic to molds. Visit us to know more about the benefits of mold removal services.